Best of frenemies: ‘A Dog’s Way Home’ is as much for adults as it is for kids. The latest cinematic love letter to the species does nothing but reaffirm all the things we love about dogs, and it’s done with the love we typically see. In fact, the movie’s director, Charles Martin Smith, has a special connection with movie portraits of animals, having directed Dolphin Tale 1&2 and, as an actor, starred in the superb 1983 Disney film Never Cry Wolf. Told from the pooch’s point of view (voiced by Bryce Dallas Howard of Jurassic World fame), we meet Bella, a stray dog living with a clan of cats in the ruins of a house set for demolition. The owner, who has the legal right to destroy the place, clashes with a couple of animal loving do-gooders Lucas (Jonah Hauer-King) and Olivia (Alexandra Shipp), who challenge the permit because animals still live on the property. Cue the local power-hungry dog catcher Kurch (a lovely etching of low-ranking evil by Chris Bauer), who seems to have a hatred for animals in general, and this dog, in particular. He resents how Lucas and Olivia have legally taken the dog into their Denver home. He tries to get the dog classified as a pitbull, so it can be declared illegal and put “to sleep”. This animal-hating creepster is frustrated that the dog is safe while it remains home, but elated at the prospect of it hitting the streets, making Bella fair game for him and his nasty dog-catching gear. To try and secure her future, Lucas and Olivia temporarily relocate Bella to a friend’s house until they sought out a permanent home for her. Bella being a dog, of course, doesn’t understand what’s going on, escapes the new place and tries trekking through some rather beautiful Colorado landscapes to get back home. All this might sound like dog-movie copperplate, and it is. Bella encounters various danger, humans with guns, humans with goods intentions, a wild cat, kids, homeless people and so forth. The film hits all the story beats you expect, and hits them well. 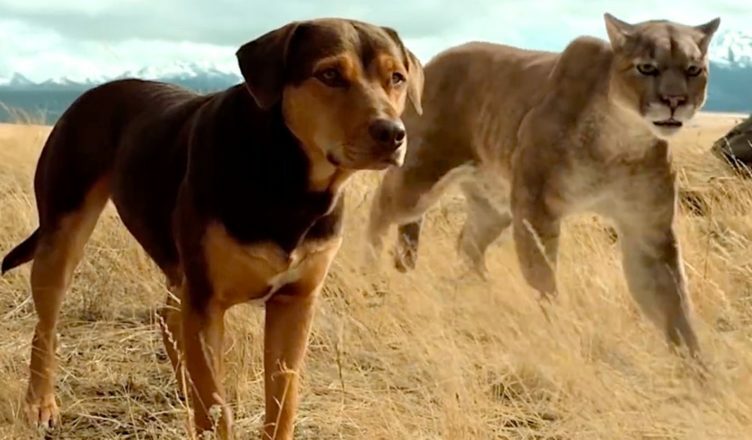 What sets A Dog’s Way Home above the pack of most animal movies is that while the film is perfectly suitable for children, it’s actually an adult movie. Indeed, any adult accompanying kids to the film might be surprised to find that the emotional highs of the film have been designed more for grown-ups. Based on the best-selling 2010 book by W. Bruce Cameron, the film tracks the introduction of care animals for war veterans, a topic that will resonate with adults far more than it will with children. So when the big story pay-off comes and it’s the police and the local council standing off against the war veterans, children might be wondering why all the adults are wiping tears from their eyes. The film certainly got under this reviewer’s guard, so remember to bring a good supply of absorbent napkins. In this tepid, uniquely stupid thriller an unadventurous newcomer to New York (Chloe Grace Moretz) is ensnared by a old French kook (Isabelle Huppert) who likes to seduce and torment young ladies. Think of a lobotomised Single White Female and you’ll know what you’re in for. There are a few so-bad-it’s-funny moments but nothing that should prompt you to pay full admission. Check it out when it’s streaming for a few bucks per view and you and your friends are in a bad movie mood. Otherwise, be warned. The inveterate Michael Caine plays a long-retired crim who, following the death of his beloved wife, plans one last mega-heist with the aid of some old friends. Jewel are his forte and there’s a juicy load just waiting to be lifted. All he and his cohorts need to do is drill through a wall that’s about two feet thick without anybody noticing. Directed with a love for criminal procedural detail by James Marsh (Man on Wire; The Theory of Everything) the film has its humourous moments, but this band of robbers are far from a coterie of gentlemen thieves. The film is essentially a hard drama about hard men who remain hard no matter how old they are. We even get glimpses of them in their criminal youth (thanks to snippets from the actors’ earlier films). Fellow veteran Jim Broadbent makes a great foil for Caine, whose trademark Cockney accent has now travelled so far down register it is now almost pure gravel. Ray Winstone, Michael Gambon, the wonderful Tom Courtenay (Billy Liar) and comedian Paul Whitehouse round out the ensemble, with Charlie Cox playing the young guy keen on learning the ropes. Oscars 2019: Who Shall Win, Who Should Win, Who Was Snubbed – and Who Will Watch?